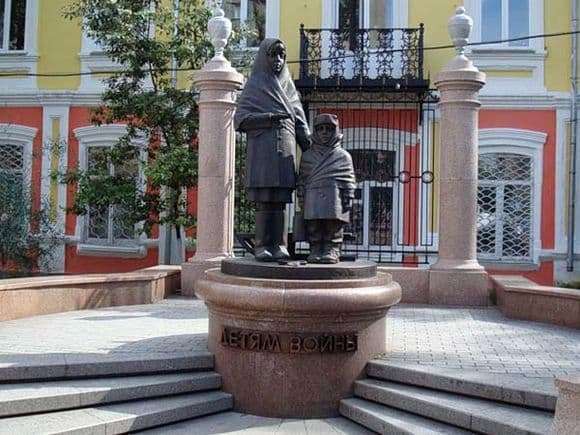 In the Siberian city of Krasnoyarsk, this pedestal was installed on the eve of the sixtieth anniversary of the victory in the Great Patriotic War on May 7, 2005. This has been waiting for a long time, about nine years. The plot of the composition was proposed by the public organization of the city “Blockade” in the late nineties. The idea arose from the fact that in wartime, three thousand people were evacuated from Krasnoyarsk to Leningrad during the blockade. In 2001, only two thousand five hundred rubles were collected for the monument, and five hundred thousand are needed. The city administration allocated two hundred thousand rubles for paving, so the problems appeared because of funding. A fundraiser was announced among the local population, it was possible to raise money only after three years in 2004. Also, the problem arose with the choice of a place under the monument. He was transferred, and then decided to stop where the streets of the Paris Commune and the World connect. The architect Andrei Kasatkin and the painter Konstantin Zinich invented the design, who created figures from his children: the eight-year-old daughter of Karim and the five-year-old son Ernest. They were dressed in certain robes, the girl was given a thin piece of bread (ration for a day during the blockade). And the boy was holding a can in his hands, with which he ran for drinking water to the Neva River. The sculptures of the girl and the boy were made of bronze, and the pedestal for them was made of granite. And behind the backs of the children there are sleds, on which at that time, in Leningrad, the dead were moved to common graves. And also made the lattice of the summer garden of this city. Military monuments always excite people, and children touch them to tears. They are treated with excitement, no one is soulless. There are always people around the design of children of war, and not only on major holidays. Children and guests come to honor the memory at any time of the year, they bring fresh flowers to the pedestal, they just stand silently and watch.